Abstract: MapReduce framework is widely used to parallelize batch jobs since it exploits a high degree of multi-tasking to process them. However, it has been observed that when the number of servers increases, the map phase can take much longer than expected. This paper analytically shows that the stochastic behavior of the servers has a negative effect on the completion time of a MapReduce job, and continuously increasing the number of servers without accurate scheduling can degrade the overall performance. We analytically model the map phase in terms of hardware, system, and application parameters to capture the effects of stragglers on the performance. Mean sojourn time (MST), the time needed to sync the completed tasks at a reducer, is introduced as a performance metric and mathematically formulated. Following that, we stochastically investigate the optimal task scheduling which leads to an equilibrium property in a datacenter with different types of servers. Our experimental results show the performance of the different types of schedulers targeting MapReduce applications. We also show that, in the case of mixed deterministic and stochastic schedulers, there is an optimal scheduler that can always achieve the lowest MST.
. The work was done during my visit from MSR in Summer 2015. This entry was posted in Big Data Computing, Journal Paper, MapReduce, Performance Evaluation, Queuing Theory, Research, Stochastic Optimization and tagged Anand Sivasubramaniam, Chita Das, Cloud computing, Computational Modeling, Delay, Diman Tootaghaj, Mahmut Kandemir, Mapper, MapReduce, Mean Sojourn Time, Microsoft Research, MSR, Optimal Scheduling, Optimization, Penn State, Performance Evaluation, Queuing Theory, Reducer, Servers, Stochastic Modeling, Stochastic processes, Stragglers, Synchronization, Yuxiong He on April 11, 2016 by blogger. MapReduce framework is widely used to parallelize batch jobs since it exploits a high degree of multi-tasking to process them. However, it has been observed that when the number of servers increases, the map phase can take much longer than expected. This thesis analytically shows that the stochastic behavior of the servers has a negative effect on the completion time of a MapReduce job, and continuously increasing the number of servers without accurate scheduling can degrade the overall performance. We analytically model the map phase in terms of hardware, system, and application parameters to capture the effects of stragglers on the performance. Mean sojourn time (MST), the time needed to sync the completed tasks at a reducer, is introduced as a performance metric and mathematically formulated. Following that, we stochastically investigate the optimal task scheduling which leads to an equilibrium property in a datacenter with different types of servers. Our experimental results show the performance of the different types of schedulers targeting MapReduce applications. We also show that, in the case of mixed deterministic and stochastic schedulers, there is an optimal scheduler that can always achieve the lowest MST. Stochastic processes, Computational model, Delayed Tailed Distribution, Optimal scheduling, Cloud computing, Synchronization, Queuing Theory, MapReduce, Stochastic Modeling, Performance Evaluation, Fork-Join Queue. This entry was posted in Research, Thesis and tagged Cloud computing, Computational Model, Delayed Tailed Distribution, Fork-Join Queue, MapReduce, Optimal Scheduling, Performance Evaluation, Queuing Theory, Stochastic Modeling, Stochastic processes, Synchronization on July 7, 2015 by blogger. MapReduce framework is widely used to parallelize batch jobs of great companies. 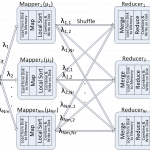 MapReduce splits the job for each mapper in the map phase and then intermediate tasks are synced in reducers to be processed in the next stage. It exploits a high degree of multi-tasking to process the jobs as soon as possible. However map and reduce phases are done by many parallel nodes, it has been realized that when the number of mappers increase map phase takes longer than usual. This problem known as stragglers issue has been observed in CDF of completion times of mapper nodes. This paper shows that stochastic behavior of mapper nodes has a negative effect on the completion time of MapReduce framework, i.e. increasing the number of mapper nodes blindly not only manages resources effectively but also can degrade the performance. To the best of our knowledge this is the first time in this paper MapReduce framework is modeled as fork-join queues from HDFS storage to one reducer. We capture the stragglers problem and based on observed delayed exponential CDF of response time of mappers we model task inter-arrival and service rate of each mapper node. Mean sojourn time (MST) which is the time needed to sync the completed map tasks at one reducer is formulated. Then we minimize MST by finding the input mapping of jobs to each mapper node. Equilibrium of means as a property of MST minimization problem can be generalized to some other inter-arrival and service time distributions. In the case of mixed deterministic and stochastic modeling optimal solution can always show the lowest MST. This approach not only can capture the optimal mapping of mapper nodes but also can address the optimal number of mapper nodes to get the lowest response time by MapReduce framework. This entry was posted in Research, Technical Report and tagged D Z Tootaghaj, GFS, HADOOP, HDFS, MapReduce, Modeling, Optimization, Performance Modeling, Performance Modeling and Optimization of MapReduce, Performance Optimization on December 10, 2013 by blogger.